Andhra style tomato upma is one of the upma varieties from south Indian cuisine, made for breakfast or quick dinner. 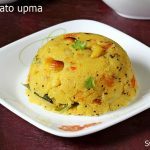 Tomato upma can be served alone or with podi. You can also add mix vegetable like carrots, peas and capsicum. Dry roast rava on a medium heat until it turns crunchy. Stir often in between to prevent burning. While it toasts, Wash, deseed and chop tomatoes. Slice onions and green chilies. Heat the same pan with oil or ghee. Add cumin, mustard, dals and cashews. Saute all together until golden. Then add onions, curry leaves and green chilies. Saute for 2 to 3 mins. Sprinkle hing. Add chopped tomatoes, turmeric and salt. Saute for 2 mins. Cook covered on a medium heat until they turn mushy. Pour water and bring it to a boil. Taste the water and adjust the salt. The water must be slightly salty. When the water comes to a boil, turn the fire to medium. Slowly pour the rava in a stream stirring with the other hand using a ladle. Stir well to check there are no lumps. Cook covered on a medium heat until the water is absorbed. Stir well. Add some ghee & chopped coriander leaves. Serve tomato upma hot or warm. The below video is to make 4 servings but the method made is same.